excellent sealing & reliability in high performance duties. K55 is only one of the extensive products in the KLINGER pump and valve sealing range. The range includes compression packings, moulded sets, low emission sets and specialised products. Ongoing Test & Development in line with the KLINGER service and quality philosophy will ensure improved performance in your pump and valve applications K55 compression packing is manufactured from PTFE filaments, which have been specially treated to incorporate a high quality graphite based lubricant. 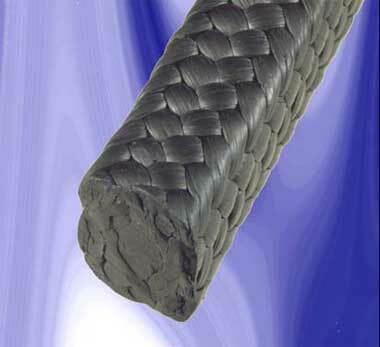 The special Klingerlock braiding process is used to produce a firm but flexible packing. PTFE based, K55 has excellent chemical resistance and is compatible with the majority of industrial media including strong acids, alkalis, oils and solvents. It is only affected by very strong oxidisers, molten alkali metals and Fluorine containing media. The graphite infusion markedly improves the heat transfer properties of the packing. This allows it to be used in dynamic applications operating at high peripheral speeds with extremely low leakage rates. reduces the number of different packing grades that must be held as stock. K55 requires only minimal gland loading to effect a satisfactory seal.